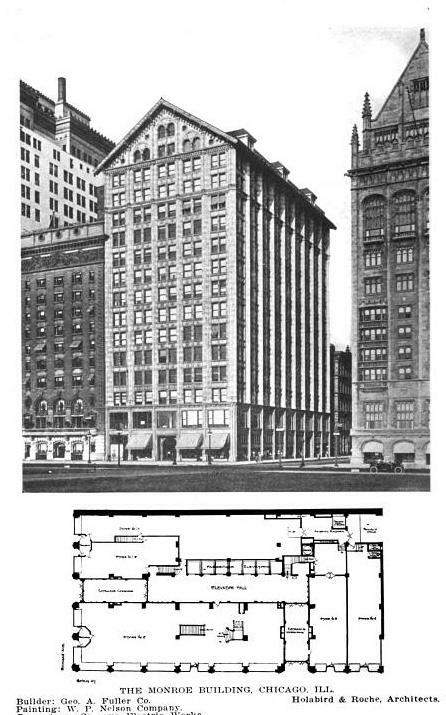 The Monroe Building designed by Holabird & Roche c. 1912 on S. Michigan Avenue in Chicago, Illinois. Beginning in 2007 a new owner undertook renovations to modernize the building, click HERE for more. Click HERE to see the Monroe Building on google street view and HERE to visit the Monroe's website. Hmmmmm? An office building with a gable roof, overhanging eaves and dormers? Odd is more appropriate. 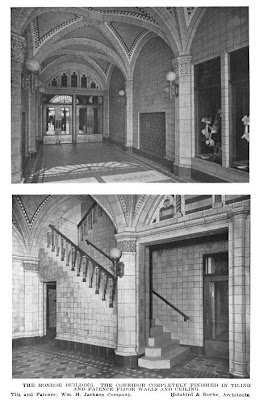 "At the peak of the Monroe Building is a two-story, 23,500-square-foot penthouse available to a single tenant. This airy loft once housed the offices of artists and architects including Frank Lloyd Wright. Today it offers all the amenities of a modern office, including a private elevator between floors, plus a feature rare in today's commercial architecture: skylights."